LCA > what is LCA? LCA stands for Life Cycle Analysis. It is a method of determining the total environmental impact of a (construction) product during its entire lifecycle, i.e. extraction of raw materials, production, transport, construction, maintenance, use, demolition and waste disposal. This involves a broad examination of the service life of the product - a holistic approach. An LCA consists of four different phases. 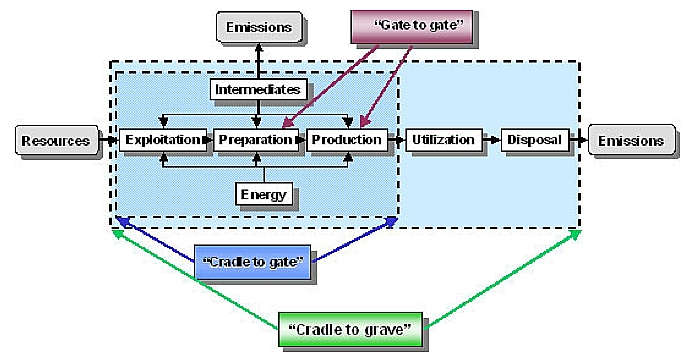 The phases are explained as follows, on the basis of the Environmental Product Declaration study (EPD = MRPI in the Netherlands), conducted in accordance with LCA methodology by Bouwen met Staal (Building with Steel). The objective is mainly determined by the target group and the intended application. The EPD target group is the professional in the construction industry. 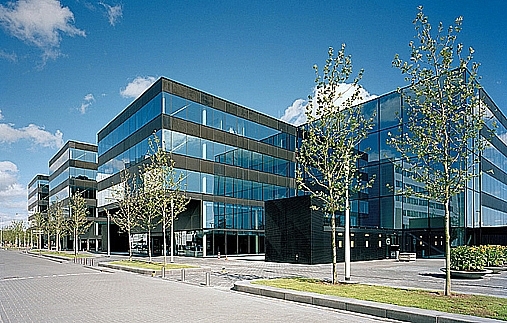 The application involves communicating (information about) the environmental impact of steel building products, such as HEA profiles to the construction industry. Or: over the entire service life of a building, from planning to demolition and possible reuse. Collecting data for each process. Collection and processing of waste. Maintenance and replacements are expressly excluded from the system limits. For example a process unit is the rolling of the HEA profile. The process tree is a complex structure. 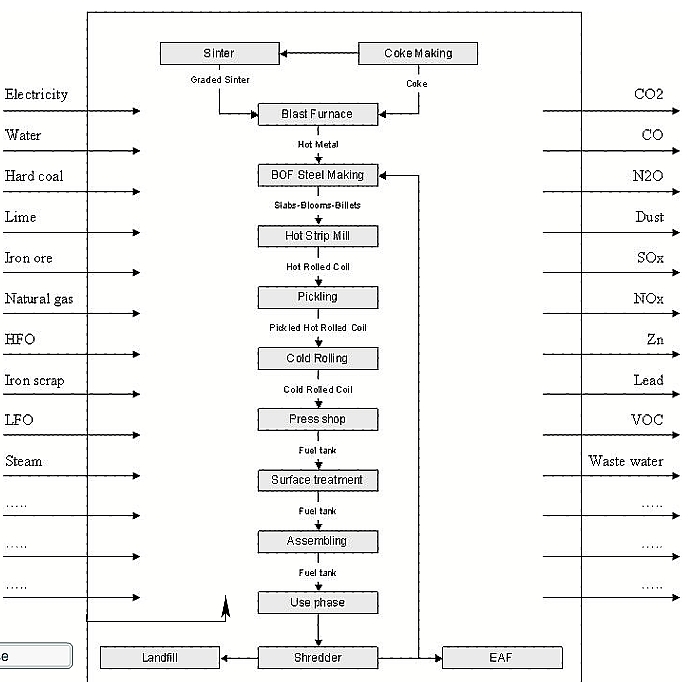 The process tree for steel is shown in the diagram below. As an example, the collection of such data involves collecting data on methane emissions from the blast furnace. In this phase the results of the survey are translated in terms of environmental impact and social preferences. This is done by assigning weighting factors or using data normalisation so that all data are presented in the same units. The EPD contains over 30 different types of emission, including phosphates, methane and zinc. Using the weighting factors, the emissions are translated into a dozen convenient environmental themes. Which themes these are depends partly on social or political preferences. 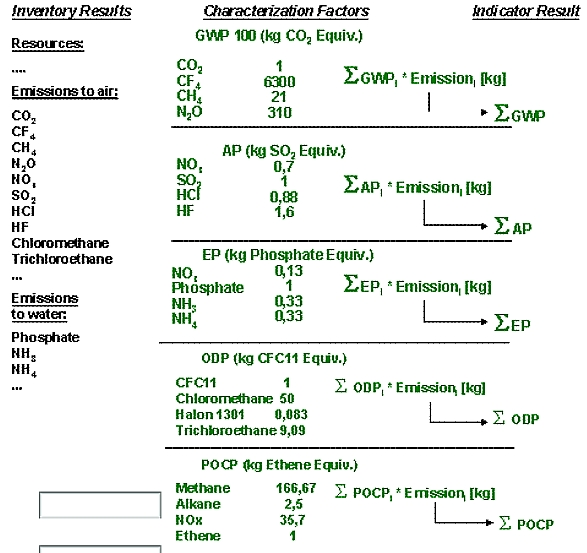 So methane, with a weighting factor expressed in CO2 is placed under "greenhouse effect" (see also the diagram below). An LCA study is quite complex and rarely or never complete. In this last phase, assumptions made during the earlier stages are evaluated, the final results analysed and conclusions drawn. Next recommendations are made for filling in any gaps and for any other possible improvements to the LCA study.